Though there's no universally accepted definition of "megadungeon," I tend to use it to mean a dungeon large enough to be the primary (or sole) focus of a D&D campaign for years. By that definition, I'm not sure that Greg Gillespie's Barrowmaze qualifies as a "true" megadungeon, but I don't really care. The fact is that the titular Barrowmaze is huge -- nearly 200 rooms, many of which have sub-areas -- and, more importantly, engaging. While it probably couldn't serve as the focus of a campaign for years, it could certainly do so for months and it contains enough "spin-off" material that it wouldn't be difficult to keep the PCs busy for even longer, should the referee desire it. Barrowmaze is an 84-page PDF describing a vast warren of underground tombs controlled by several Chaotic cults. 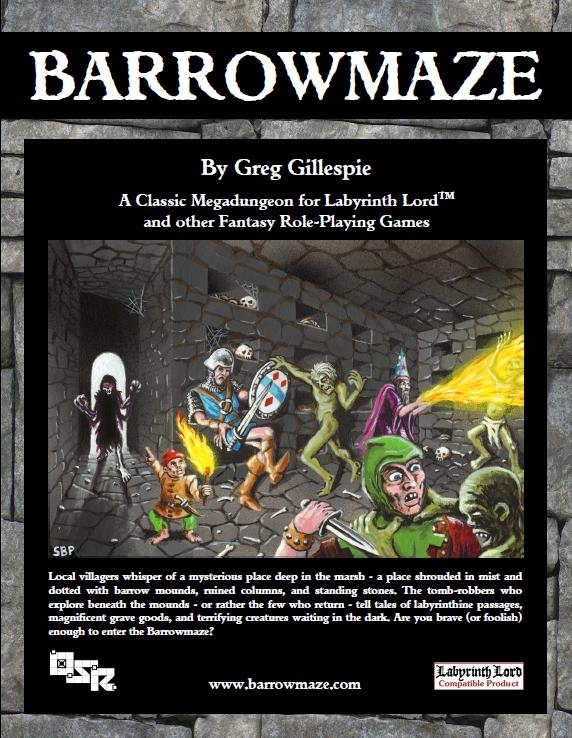 Written for Labyrinth Lord but easily adaptable to any old school class-and-level fantasy RPG, Barrowmaze is simply laid out using a two-column format, punctuated by black and white artwork, much by the excellent Stefan Poag. Poag's illustrations are wonderfully evocative of the weird combination of elements that characterize old school play -- equal parts mystery, fear, and black humor, all viewed through a phantasmagoric haze. I can't deny that a large part of my positive feeling toward Barrowmaze was generated by Poag's contributions. That said, the artwork throughout the product is very good, with artists Toren Atkinson, Zhu Bajie, Trevor Hammond, John Larrey, and Jason Sholtis all turning in some terrific pieces. Barrowmaze has a number of virtues that, I think, set it apart from other dungeons, including some other recently published ones. First, Gillespie's style is spare without being cramped. I know it's popular in old school circles nowadays to praise room entries that read "6 giant rats, 2 gems (25 gp each)," but, especially in a published product, I prefer a little more meat. Conversely, I have no interest in reading paragraphs upon paragraphs of room description, complete with detailed histories and personalities of the monsters and NPCs therein, so the middle road Gillespie took very much appeals to me. Second, the Barrowmaze has lots of empty rooms, unguarded treasures, and tricks and traps. It's, in my opinion, a perfect mix of the elements that make old school dungeon crawling not just possible but enjoyable. Third, Barrowmaze has a theme -- in this case, undead -- that helps to give the dungeon a feel. There are other monsters than just undead here, of course, but the undead, including many new varieties, are its primary antagonists and that goes a long way toward giving Barrowmaze the cohesion necessary to avoid being just a fantasy funhouse. Finally, the dungeon is sprawling. Rather than multiple levels stacked on top of each other, the Barrowmaze fans out in multiple directions on a single level, which not only further contributes to its unique feel but also sets it apart from most other large dungeons. I'm hard pressed to find any real faults with Barrowmaze. Nearly everything about the product is well done, from the layout to the artwork to the content and cartography. Indeed, Barrowmaze is nearly a textbook example of how to make a compelling, well-presented dungeon module. More than that, it reaffirms my belief that, despite the standard complaints from veteran gamers, the dungeon remains not merely a viable but a powerful locale in which to set fantasy adventures. This hobby was born in the dungeon and, while it's probably good for its long-term health to seek fresh from time to time, there's still much to be gained by returning to its point of origin regularly. If I had to settle on a nit to pick, it'd be that there's currently no print option for the book, which is a shame, because I'd happily pay for a copy to put on my shelf beside Stonhell and the Anomalous Subsurface Environment, two other recent dungeons that made me sit up and take notice. I suspect the primary knock against Barrowmaze will be that it's "just another dungeon," which is unfortunate, because I don't think that's true at all, for reasons I've stated above. Gillespie has done a wonderful job of synthesizing the wisdom of the Old Ways with more recent theorizing about the same to create something that distinguishes itself from other dungeon modules. And I say this as someone who's preparing to bring his own megadungeon to publication shortly. Given that it's price is only $6.66, I nevertheless recommend that even the congenitally dungeon-averse pick it up, if only to see what a well-done dungeon crawl looks like. It's my hope, though, that Barrowmaze might change a few minds as well, reminding them why it was that so many of us spent untold hours in underground vaults when we first entered this hobby. Buy This If: You're in the market for a new dungeon with which to kick off a campaign or just want a well-done dungeon to loot for ideas. Don't Buy This If: You really, truly have no interest in dungeons and can't imagine ever using one in a campaign, whether in whole or in part. I agree, whole-heartedly, with your assessment. 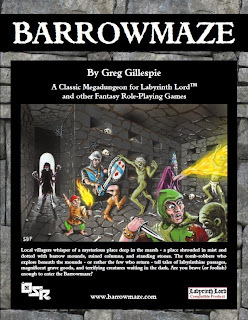 Barrowmaze is the best example I've seen of a dungeon adventure module done right. Throughout my entire gaming life I've been disappointed by published adventures, and have become an increasingly vocal critic of the design flaws that make them unsatisfactory as play aids. Barrowmaze is the first adventure module that I actually plan to use; indeed it is about to become the cornerstone in my campaign. With respect to Barrowmaze being a megadungeon, my understanding is that this is just the first part of the dungeon and that Greg intends to follow up with expansions. So I think it is very possible for Barrowmaze to be the foundation of a campaign and will develop into a true megadungeon campaign setting. "Buy the print copy and the .PDF is just $2.00! [Update (Feb16): Print will hopefully be available next week]"
James, thank you for taking the time to review. Lightning Source has, well, been anything less than lightning and snailmail hasn't been kind either. Softcover and hardcover print are nonetheless in the pipe. There are extras at www.barrowmaze.com and I've already begun on a second "half" dealing with mid and upper level play. I know it's popular in old school circles nowadays to praise room entries that read "6 giant rats, 2 gems (25 gp each)," but, especially in a published product, I prefer a little more meat. I agree with you here. I think the concrete features of a room are often more important than the attending monsters; the urns and tables and chandeliers and all that stuff are what the PCs work with to take action. I might make my own notes that spare if I have a good mental image of a room already, but with someone else's dungeon it's very helpful to have more to build from. I also agree. I think it's possible to find a balance between too much and too little detail, and this sounds about right. I thought Stonehell addressed this well with the huge listing of "dungeons dressing" in its appendix. One thing I couldn't figure out is what levels is it designed for? I don't think it lists it on the cover nor did you mention it in your review. Also, when using a "theme" such as undead, sometimes there can be power (don't want to use the dreaded balance word) issues if a cleric/paladin or multiple turning classes are present. Any pointers within the module that address that concern? The DM needs to be able to adjust for things like that, on the fly if need be. It's a basic skill that an "Old School" DM needs, in my opinion. That may very well be, but skills aren't learned in isolation. Brief advice, or pointers to advice, can help people develop these skills (or at least be thoughtful about them) if they don't already have them or don't already have them well developed. Nice review. It sold a copy of Barrowmaze. I am reading it now ... thanks!! how hard is the conversion to use this with ACKs. thats the system we are looking at starting and this sounds like a nice spot for the players to Vacation. im guessing from the webpage that its for lower levels is there a suggested level. The monsters in Barrowmaze range from 1 to 7 HD, with most being in the 1-4 range, I'd say. That means you're probably looking at a dungeon geared for 1st to 5th level PCs, more or less. The sample player-characters in the back of the book are all level 1.
how hard is the conversion to use this with ACKs. Not hard at all, since ACKS is based heavily on Labyrinth Lord. It's not like the differences between the two games are all that significant. Very nice. I'll definitely be ordering this new print edition soon. Just waiting for the print version! Can you give an example of a combat encounter? I ask because most dungeon encounters I come across are in featureless square rooms - or worse still, through the doorway of the room. I need encounters with interesting environments (even if it's just furnishing) and maps that encourage movement rather than chokepoints.